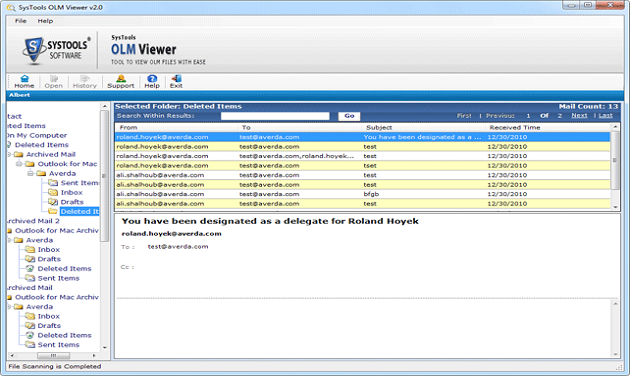 OLM Viewer allows user to OLM file in Windows platform open in normal view and read OLM file components such as Emails, Calendar, Notes, Contacts etc. There is no need to convert OLM file to PST to view in Outlook. First of all, OLM file viewer scanned loaded OLM file given by the user, It loads all folders of OLM files consisting mailbox files. The Software also displays attributes associated with emails such as from emails address, the subject of messages, emails received time etc. Once the software scan the OLM file, Olm Viewer gives user an option to store scanned files. With the help this open, a user can save time by again reloading the file in the software. OLM file viewer completely preserves data stored in the OLM files.There is no loss of emails attachments, contacts details and calendars details such as, data, time etc remain unchanged. The User-friendly and interactive interface of OLM Viewer helps user to easily preview the details of OLM file, Even a novice user can run tool very easily. Since Software automatically scans the olm file, so you don't need to be a technical expert for using it. 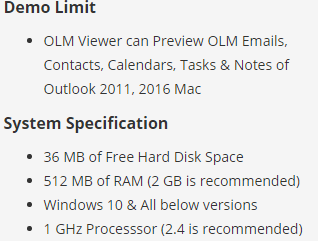 Outlook Mac stored user data in a Database file format called OLM File format. It stands for Outlook for Mac File. 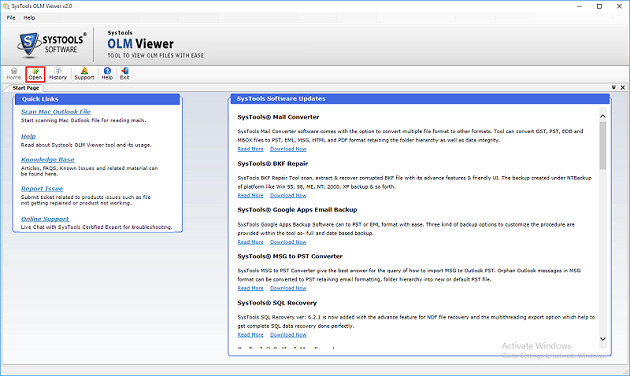 This file format supported by Mac Outlook 2011 email client. The size capacity of file not defined by Microsoft but size should not be greater than 2 GB. A Mac user can create the database of emails, notes, calendar, contacts and save them into OLM File externally and save them for later backup and default location of file is /Documents/Microsoft User Data/Office 2011 Identities/Main Identity/. 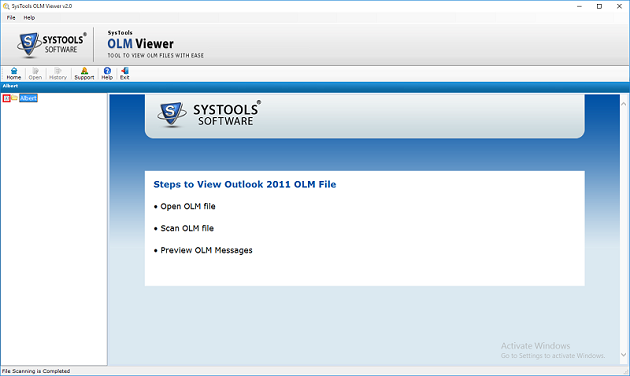 In Different scenarios, OLM viewer can help the user to view data stored in OLM files within Windows Operating System. 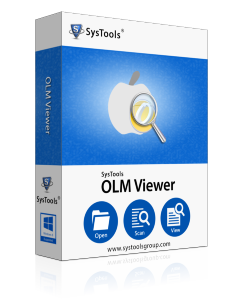 Tool specially designed for Windows user to Open & Read OLM Files. The Upgraded version of OLM Viewer (Pro), also allowed to convert the OLM File into 3 different file format: PST / EML / MSG.. Tool scan large size OLM file without any size limitation and offers an option to split them into small PST file format during the conversion process. Convert OLM File to Different Email supported format. Split File while conversion to avoid Size issues. 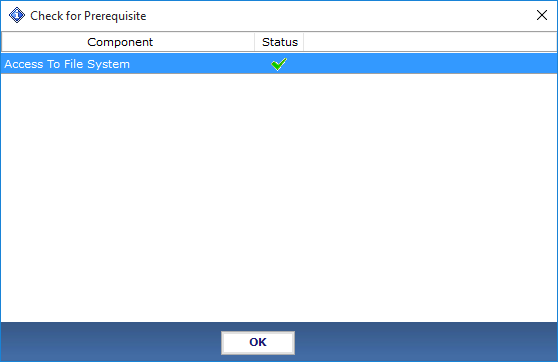 Tool check for Prerequisite Component to run within Windows system. Now click on the Open Option to select the OLM File from the system. Now Browse the location of OLM File in the local system. User can view the Processing procedure of OLM File. A POP-up appear after successful scanning. Click OK to proceed further. OLM Viewer offers option to save scanned file, Click Yes to store scanned OLM file for later use. Click on "+" to expand the files stored in it. When software Open OLM file. Preview Emails, Contacts, Calendars and Tasks details of OLM file. OLM Viewer Tool - Replies All Doubts & Queries! OLM Viewer Tool run on Mac Platform or not? 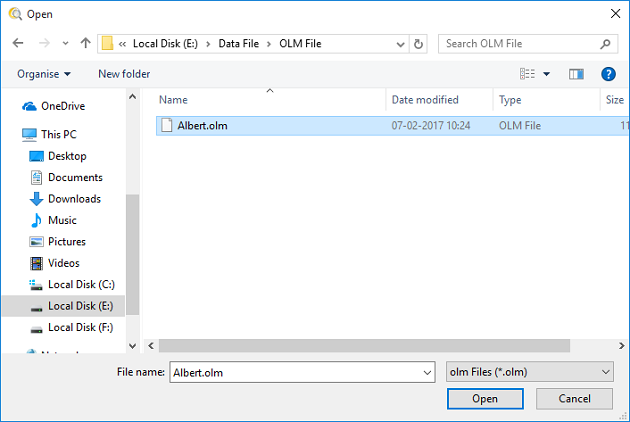 No, OLM Viewer is available for Windows platform to Open OLM files. Is there any size limitation to read OLM file using the software? No, the users can easily read & preview details of olm files. Does OLM Viewer Free tool supports Windows 10? Finally, Now I can open my OLM of MAC Outlook with the help of OLM Viewer Tool in Windows Platform in few clicks, and view all details of Emails, Contact, Notes & Calendar files. I was looking for an OLM Viewer Software to open my OLM Files. Fully satisfied with the features and working of the software. Now I can view all the details of emails more effectively.